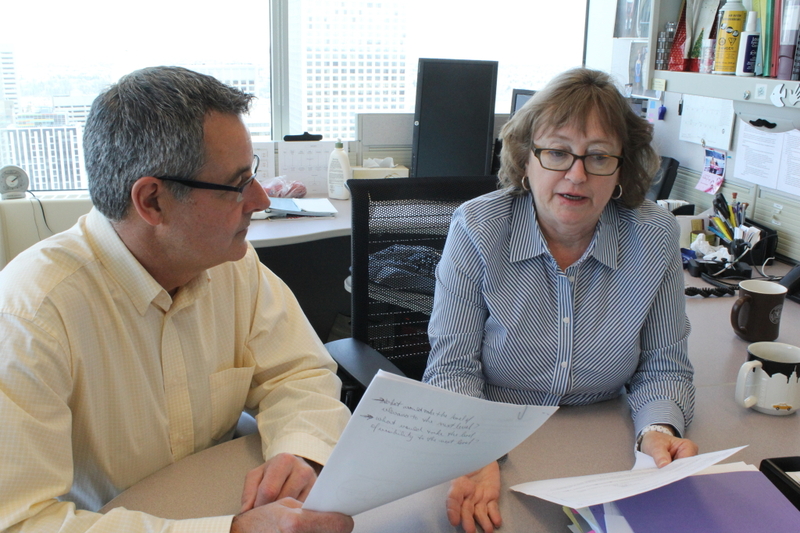 Joe Loran, Deputy Ombudsman, and Diann Bowes, an investigations manager who heads up the Ombudsman’s Own Motion Team, discuss an ongoing investigation. Last year, the Alberta Ombudsman created a special investigations team. Its mission was to conduct own motion investigations, which can be triggered at any time, on any matter of public interest under our jurisdiction, by the Ombudsman. A year later, the team has three investigations underway. “We want to increase our exploration of systemic issues, so we’ve assembled a team of investigators to delve into the issues that may be behind some of the individual complaints our office receives,” said Peter Hourihan, the Alberta Ombudsman. For example, a resident at a provincially funded facility may complain staff are treating her unfairly. This could be a one-off event. However, a number of similar complaints could indicate a more systemic issue, or a pattern of unfair behaviour – and that’s when an own motion investigation can be launched. Of course, to determine what the systemic issue is, and to track the outcome of investigations, the own motion team takes a proactive approach. It tracks trends, analyzes internal and external data, reviews previous complaints and investigations, and monitors news and other information sources. The three current investigations relate to: issues identified with the Citizens’ Appeal Panel and the provincial department of Human Services; delivery of health care at the Edmonton Remand Centre (ERC) and the management of the patient concerns resolution process at the facility via Alberta Health Services; and the Disciplinary Hearing process for provincial corrections. The Human Services investigation is determining whether appellants are given adequate time and information to prepare for their hearings. Specifically, the investigation will focus on the actions of administrators in the department of Human Services, including timeliness, adherence to policy, and the adequacy of information. Another own motion investigation is reviewing whether the patient concerns resolution process of AHS at the ERC is functioning appropriately. This investigation will focus on inmate access to the process; the policy governing the process; contact points within the process; and the working knowledge of staff involved in the process. While the own motion team is new, the Ombudsman has launched 72 own motion investigations since our formation in 1967. In fact, one of our earliest own motion investigations, in 1973, dealt with the escape of patients from Alberta’s mental hospitals (as they were called at the time). Other reports have looked into the adequacy of day care licencing investigations (1993), conditions at remand centres (1981), foster care recruitment and screening processes (1980), and grazing leases (1976). In 2006, an Ombudsman own motion investigation revealed a significant number of Albertans were unfairly treated after the Alberta Agriculture and Food ministry failed to inform them of a change in the timeframe to apply for compensation under the Remote Area Heating Allowance Program. The department reimbursed 31 qualified Albertans. Provincial cabinet ministers can also order the Ombudsman to launch a special investigation. Since 1967, we have completed 10 such investigations, ranging from the 1989 investigation into the scandal surrounding the collapse of the Principal Group of Companies, to a report that looked into the death of a steelworker who committed suicide in the Calgary Workers’ Compensation Board office in 1991. Both own motion and ministerial-ordered investigations are important tools which allow the Ombudsman to investigate matters to ensure Albertans are treated fairly, and processes and policies are in place to meet this expectation. The last ministerial-ordered investigation occurred in 1995. These investigations can be an effective way to demonstrate accountability and transparency.